I’ve read recent article on Wired titled The 12 Cellphones That Changed Our World Forever. To be honest when I’ve checked those phones I felt this article has too narrow view of things. There are many other cellphones contributed to change the world. 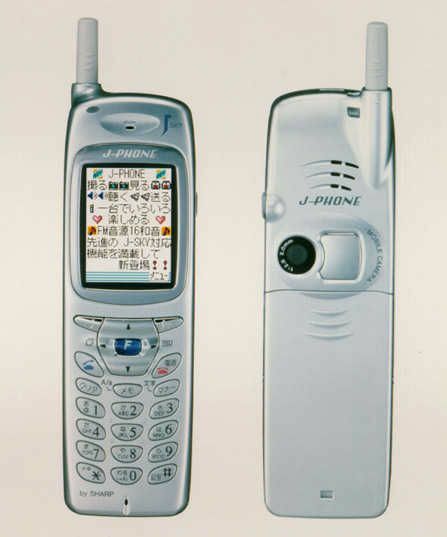 I picked up 5 Japanse cellphones influenced not only Japanese market but the whole mobile industry in the world. 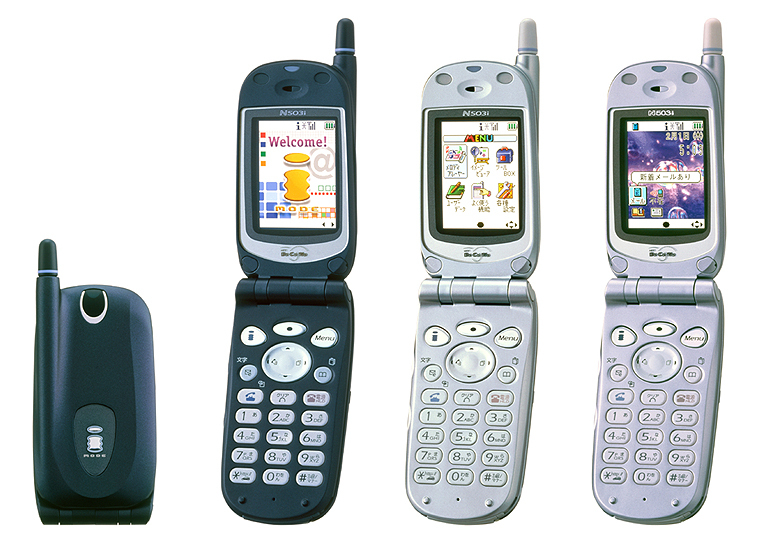 When Nokia 3210 came into the U.S. market, first i-mode handset was released in Japan. i-mode was a mobile internet service in Japan used data format cHTML(compact HTML) based on HTML. By the success of i-mode service, many mobile content providers grew in Japan and established monthly subscription businesses. 1999 was also a year Nokia introduced S40 OS into the market. 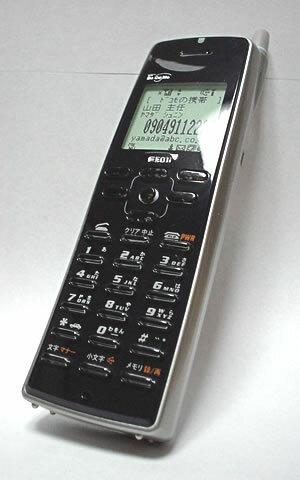 First handset adopted to i-αppli service by NEC. i-αppli enabled to run Java applications on mobile. 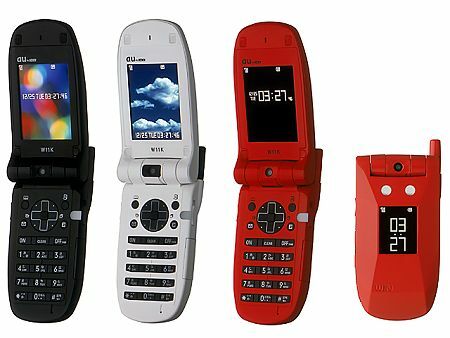 Together with a sister model Hitachi W11H, Kyocera W11K was the first handset adopted to fixed unlimited data plan in Japan. Till that time, mobile users needed to pay data fee based on usage. After the success of this handset and unlimited data plan, mobile web usage exploded and brought many freemium services similar to PC internet business. First handset by Sharp enabled Sha-mail(Photo mail) service. This was one of the earliest handset installed camera on mobile. This handset is also a classic one… 8 years earlier than iPhone, used touch front LCD screen interface instead of actual buttons. Facebook Spot Information is becoming popular in Japan after Facebook had started Check-in Coupon (Check-in Deals) in Japan. The problem arouse when Recruit[E], Japan’s largest coupon business player, registered spot information of restaurants on behalf of restaurant owners without enough notification. Hitoshi Nakamura(twitter id: hitoshi[J]) , one of the most famous restaurant owner who has a deep knowledge on social marketing, reported on his blog that Recruit registered spot information of his restaurant without getting agreement from him. He noticed this when his customer requested to use a deal posted by Recruit on Facebook spot information. Recruit is operating a service known as Hot Pepper[J], a free paper media distributed in town like “am New York” [En] or “metro [En]” but only includes coupons of restaurants and beauty salons instead of articles. There is also an web site to search restaurants and coupons on Hot Pepper. Shop owners pay fixed fee per month to get their coupons printed on this media. With those data of restaurants and coupons, Recruit, instead of restaurant owners, started registering spot information with coupon. Recruit sent this announcement to 40,000 restaurants and registered information of restaurants except those replied to not register. That means when there was no response, Recruit also registered shop information, took an opt-out process. As a result, duplicated shop information had registered for some restaurants already have their shop information on Facebook. Recruit says, they checked restaurant names to prevent to register another shop information for those who already registered them on Facebook. But if there is a slight change on the name of restaurants, spell, big letter or small letter, with or without hyphen , etc., spot information had registered in additional to the original one. This had caused troubles. Restaurant owners with original spot information could not publish Check-in coupon since Recruit had already published coupons for another spot information with the name of same restaurant, and Facebook judged it as a break of service agreement. So Recruit jacked the spot information and the right to publish coupon. Recruit de-registered shop information for those requested to do so but not only restaurants, Recruit also had registered spot information of hotels on their hotel reservation site, Jalan[J]. This case implies that anyone can register shop information to get more exposure on Facebook Check-in. Yelp, Expedia, or any other player can do similar thing. Although they can not connect directly to their services at least you can get more awareness for your service. So how Facebook will respond? Is this going to be another battle field to get a better position on the list of web page like we do for Google search results? The largest it industry conference by invitation, Infinity Ventures Summit[J] was held at Sapporo in May 26th and 27th. Among many sessions, the most surprising topic came out from the mouth of Isao Moriyasu, the executive of DeNA who promised to be the next CEO in the end of June. DeNA has been released series of games titled with the word “royal” proceeding after the launch of their first successful in-house social game “Kaitou Royal” (English title is “Bandit Nation”. Although being really successful in Japan, Bandit Nation closed on August 31, 2010). Those games have same common denominators as a series, do missions, battle against other players, and collect treasures. All Royal titles has been achieved more than 1 billion yen ( 12 hundred million US dollars ) sale per month. Ninja Royal is the latest royal series released for Android smartphone. Moriyasu announced they started to develop this title with only 3 staffs at the beginning; 1 planner for full time, one another planner partially working on this project, and 3 engineers. 2 out of 3 engineers were new graduates. Then they added 2 more engineers later and released this title within 6 months. This is an incredible case representing well how DeNA is running a highly profitable business. 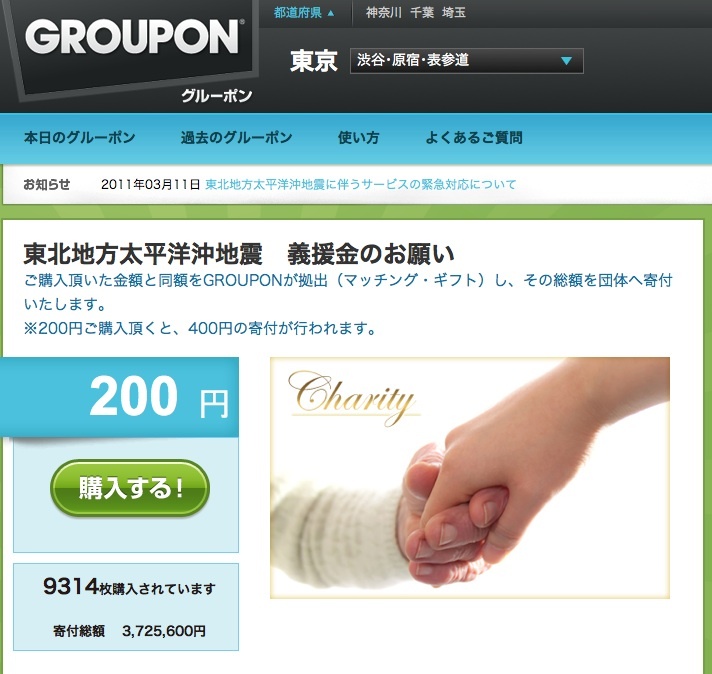 Groupon Japan starts a special offer for collecting donations from users. If you purchase an offer costing 200 yen, Groupon Japan will donate 400 yen to the group helping the recovery for earthquake hit east coast of Japan (“Japan Red Cross is planned”, the page says). More than 9600 users has joined to this campaign, and the sum of donation to be made by Groupon is now exceeding 3.8 million yen. iPad 2 is expected to be released soon, and here is a lucky man who received brand-new iPad from his daughter. @harux tweeted that he wants an iPad. 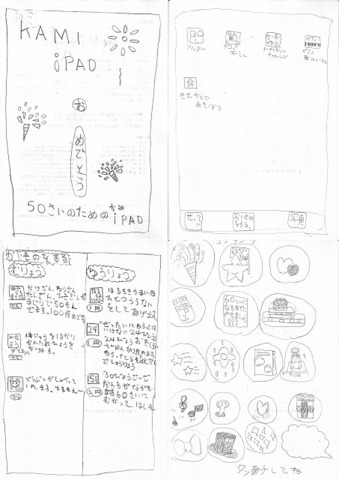 His daughter saw his tweet then made a handwritten iPad for his birthday present. He says she drew about 20 screens, and unveiled 4 of them. There is a screen for shopping and you can see there are lists of free menu and paid menu. You can also find an icon saying ‘Let’s lose weight until your 60 years old birthday’.